"I play the flute, and teach you how." 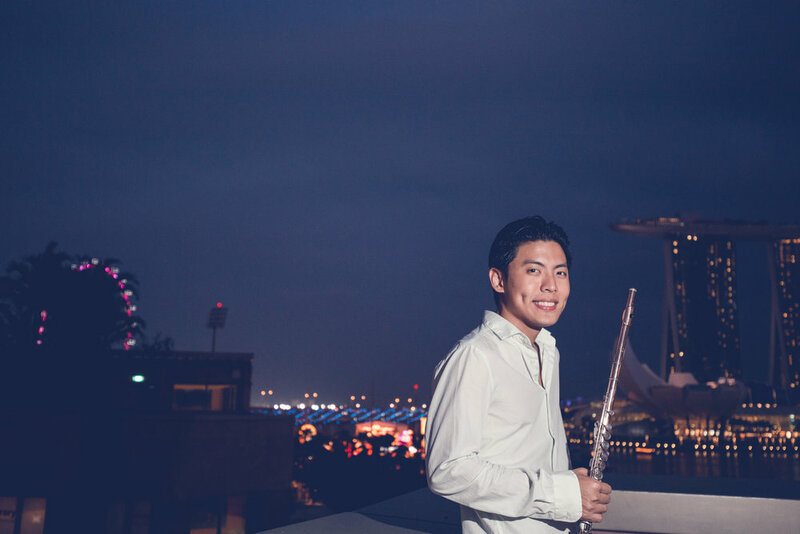 Singapore-based award winning flutist, composer, educator and recording artist, Rit Xu has emerged as a leading light of his generation and is slowly gaining international recognition for his lyrical, thoughtful and introspective musical voice on the flute. His passionate, wholehearted and at times highly energetic performances has won the admiration of fans and fellow musicians worldwide. In 2014, Rit was recognized for his finesse as a flutist and improviser by being named winner of the NFA Jazz Artist Competition; the first Southeast Asian to win a solo jazz competition in the United States. An honors graduate in classical flute performance from the famed Yong Siew Toh Conservatory of Music of the National University of Singapore, he is equally comfortable playing to an audience in the thousands on the hallowed stages of the concert hall as in an intimate jazz club with listeners at close proximity. With a keen focus on shaping improvised melodies that draws influence from notable trumpeters, saxophonists and practitioners of the jazz tradition, Rit Xu is an instantly recognizable performer––pushing the boundaries of what the flute can achieve sonically and emotionally outside of its familiar association with Western classical music. Since bursting onto the Singapore jazz scene in 2011 after winning first prize in the Thailand International Jazz Solo Competition, Rit has steered a steady course of growth as an instrumentalist, composer and collaborator. In recent years, he was prominently featured with the Swiss Youth Jazz Orchestra at the annual Jazzaar Festival led by Swiss jazz stalwart Fritz Renold. He also took part in a region-wide audition and successfully won a coveted spot –– making his debut with the Asian Youth Jazz Orchestra’s inaugural performances which took him around six countries in Southeast Asia and three cities across Japan. Back home, Rit is an integral sideman with jazz icon Jeremy Monteiro. He is also a key member of the Lorong Boys; a classical-pop fusion group accidently shot to fame on social media with their humorous and light-hearted juxtaposition of classical music and top 40s. Still only in his twenties, Rit Xu is also a first-call flutist in the studio recording scene –– bringing with him a wealth of experiences inside the recording booth laying down flute tracks to television commercials, films, video games, documentaries, and pop music albums since the age of 9. Although the Boehm flute is his primary tool of expression, his versatility extends to a broad spectrum of instruments in the flute family including the EWI, Chinese bamboo flutes, shakuhachi, Indian bansuri, Andes quena and the pan flutes. Rit played all flute solos in the soundtrack of Taiwanese epic movie, Warriors of the Rainbow: Seediq Bale, which won the 48th Golden Horse Award for best original film score. He is committed to musical excellence and inventiveness at any live or recording situations. As a passionate music educator, Rit Xu has been teaching the fundamental to finer points of flute-playing since 2008. 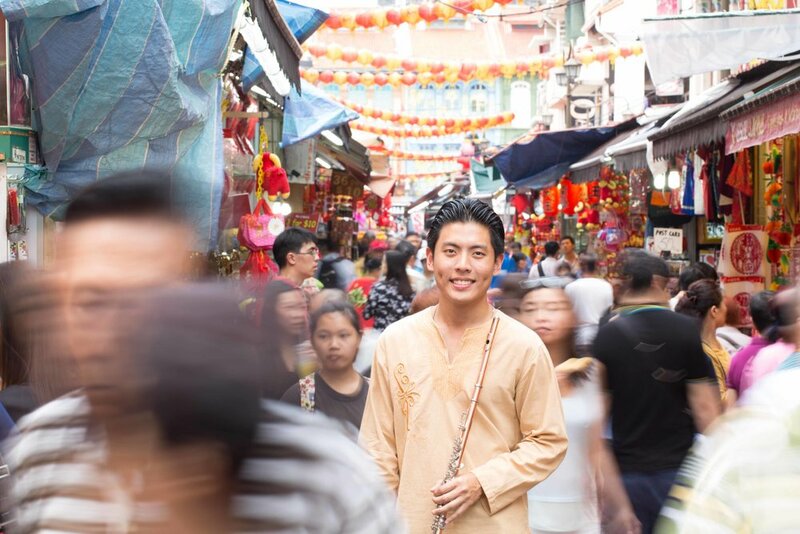 Founding www.flutelessons.sg in 2016, he made it his mission to turn out as many students that have the same love for music and flute as he does. Equipped with both theoretical knowledge as well as real-world musical experiences across a range of genres, numerous of his past and and present students have aced through Graded Examination and enjoying a life in music as aspiring professionals or aficionados. At his free time, Rit enjoys a variety of sports such as mountain biking, indoor climbing, swimming and competitive bowling. He also has a keen interest in positive psychology, achieving mental well-being and read a lot into the humanities––especially world history. Rit plays on Powell and Weissenberg flutes. The Rit Xu Group has slowly gained popularity amongst avid fans and listeners from different walks of life across the island with their signature instrumental sound – groovy, balladic and emotive flute renditions of current and classic pop tunes – at times with an ethnic twist. With an eclectic musical background ranging from pop, classical and jazz, the conservatory-trained and award winning bandleader unintendedly blurred the lines of what the flute can achieve outside of its familiar association with western classical music.